Maybe that's not the order in which ol' Sam would list his achievements if he wrote his own resume, but it's the familiar slogan you'll find on bottles of beer made by the Samuel Adams Brewery. And when you tour this Boston landmark—one of the must-see attractions in Boston—you might just be convinced that lending his name and face to the beers produced by the Boston Beer Company is this hero of the American Revolution's most glorious legacy. Touring the Sam Adams factory is a memorable experience, but first, so you can get straight to the free beer if that's your priority, here are all of the details you need to plan a visit to the brewery. 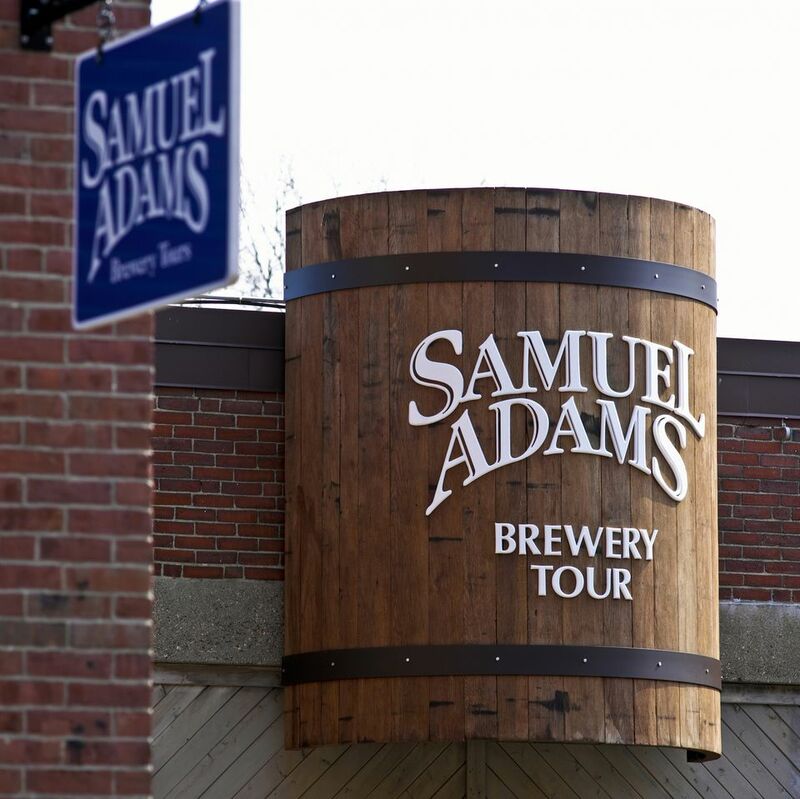 Tours of the Sam Adams Brewery are offered Monday through Thursday from 10 a.m. until 3 p.m., Friday from 10 a.m. until 5:30 p.m. and Saturday from 10 a.m. to 3 p.m. roughly every 40 minutes. Tours are free, but a $2 per person donation is requested, and all monies collected are donated to local charities. The tour is open to all ages, but you must be 21 with proper ID to sample beer. For more tour information, call 617-368-5213. The wait in line for a tour can be significant, particularly on Saturdays, so plan your visit for early in the tour day if you can. Here's an added incentive to be an early bird. You can reserve tickets online in advance (the cost is $10 Monday through Thursday and $15 Friday and Saturday as of 2018) for the first tour of the day: the Morning Mash In. You'll need to arrive at the brewery by 9:30 a.m. for this tour, and as an added reward for dragging your carcass out of bed, you'll get to sample something special. For those who have already taken the free classic Sam Adams Brewery tour, two new, in-depth experiences encourage a repeat visit. Reserve your spot online for the Beyond the Brewhouse tour ($20-$50) or the Barrel Aged Experience $30). The address for the Samuel Adams Brewery is 30 Germania Street, Boston, MA 02130. It is a bit off the beaten path in the city's Jamaica Plain neighborhood. For recorded directions, call 617-368-5080. Leave yourself plenty of travel time: Driving in Boston can be tricky, and parking can be even trickier. You may want to get to the brewery by subway (The "T"). Take the Orange Line toward Forest Hills, and get off at the Stony Brook stop. From there, you'll need to walk to the Brewery by taking a left onto Boylston Street, your first right onto Armory Street, then your first left onto Porter Street. At the end, turn right and proceed toward Germania Street and the brewery's gates. Boston's a historic city, so expect this brewery tour to be a lesson in the evolution of the Sam brand, which will amp up your appreciation for the company's products by the time you reach the tasting room. Samuel Adams' popularity has soared as its line of beers has expanded. There's even talk now that Samuel Adams is too big to be considered a "craft" brewer. You'll probably hear a bit about Sam Adams' founder, Jim Koch, who, with three degrees from Harvard, is the "most educated guy in the beer business." Koch's great-great-grandfather had a brewery in St. Louis, and the recipe for Samuel Adams Boston Lager—the brewery's flagship beer—is derived from an old family formula. Your tour guide will also share a brief history of beer in Boston. You might learn, for example, that more beer was produced and consumed in Boston than anywhere else in the U.S. 100 years ago. The best part of the tour is the opportunity to see the brewery in operation. Your guide will try to hold your group's attention by sharing the Seven Wonders of Sam—taste, aroma, complexity, body, smoothness, finish and balance—by allowing you to taste beer ingredients like Hallertau hops and by telling you about Sam Adams' revolutionary introduction of the idea of labeling beer with a "born on" date. But with the beer hall-style tasting room only a few steps away, he has his work cut out for him. Once crowded inside the tasting room, you will have the chance to sample several products made by the Boston Beer Company, which makes Angry Orchard Hard Cider and Twisted Tea Hard Iced Tea products in addition to the Sam Adams line of beers including the flagship Samuel Adams Boston Lager. Of course, it is impossible to depart without passing through the gift shop, where you can purchase all variety of items featuring the immortal portrait of the famous patriot and brewer, or brewer and patriot if you prefer. If you can't get to Boston, a variety of Sam Adams gifts can be purchased online at the brewery's online store. While you're in Boston, you can also tour the Harpoon Brewery. If you're a craft beer and microbrew lover planning a trip to New England, be sure to read... Yankee Brew News. Want to sip the best beer in the world? You'll have to travel to Vermont.